While many women consider jewelry to be their best friend, or shoes, or Prada purses, my choice runs to furniture. Curb furniture, specifically. 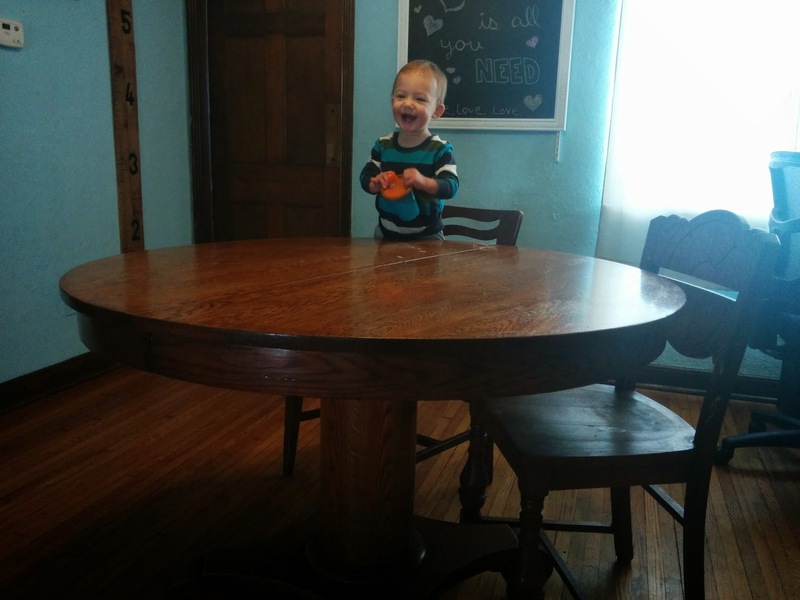 Years ago, as we ran for our lives when our house caught fire, I thought not of the keys to my van, my credit cards, or even baby photos, I wanted to save my kitchen table. Let me say it is not just any table, it came from a distant relative, one, Harriet Beecher Stowe. It was 42" round, made of oak with a single pedestal and missing its leaves. I had refinished it many times. I often thought my cousin/aunt/whatever might have penned Uncle Tom's Cabin while sitting at it. But alas, there were children to save and it was just a momentary thought. How it came into my possession may be considered something of a "steal". When our family first moved to Cleveland it was considered the trendy thing, to own a Formica table with chrome legs. Grey or pink or tan, with speckles preferably. Matching chairs with uncomfortable seats completed the set nicely. The Harriet Beecher Stowe table was relegated to the basement. I let it be known to my parents that when they died, I wanted the table. I think I even said it to their faces. Many times. Fast forward four years to high school graduation. They would be moving to DC, and I would be staying behind. The Cleveland that I didn't like became the place I couldn't leave. I would be getting an apartment down the street with my younger sister, Michelle. [Notice to Folks:] "I can't wait till you die, I'm taking the table NOW!" Adam and the "All you need is love Harriet Beecher Stowe table"
The table was one of the few (less than 25) items that survived the fire. It needed a do-over but was intact. When it left my possession a few years ago to take up residence at son and new daughter-in-law's house in Columbus, the caveat was....it must stay in the family! Within a week, I combed Craigslist for another one. Sure, it wouldn't have the same lineage, but I needed my feet under a table with history. The table I found came from Brecksville. It was the last vestige of a restaurant that the owner's mother had opened with hard earned savings of $1200.00 during the Depression, which she invested in near the steel mills. I needed a bib to keep the drool from running down my chin, but plunked over the pittance he asked for. I restored it in two days. This past month has been rather calamitous, not like having your child diagnosed with a terrible illness, but would certainly register on the Life Stress scale. There were the several weeks of flu/pneumonia/bronchitis (that still seems to be visiting). Two-day-a-week physical therapy with a TENS unit plus 14 do-it-yourself sessions. Right now PT is the band-aid for knee replacement. When I try to do an analogy in my head, I envision The Black Knight from The Life of Brian referring to his missing limbs as "merely a flesh wound". Then there were the hundreds of thousands of gallons of water that poured out of my newly thawed pipes, the search for the leaks, daily traversing open joists to get to the shower, many dehumidifiers, two air movers, and a frozen partridge in a crawl space. The utility bills for gas, electric and water are starting to dribble in; think a teensy bit less than the national debt. Oh, and the topper, today house taxes were due. And, paid, thanks to all who subsidized that effort by availing themselves of my refurbishings even though a house was meant to have walking space in addition to furnishings (Bethany). If you are all thinking....."will she get to the POINT!" I will. Nobody that I know and love died this week, although I know people who had that experience. While I was pinched for cash to make that deposit yesterday, I had pennies to roll and cans to recycle, and a last minute sale came through on Craigslist which made me flush (what an awful word-seriously, when I didn't have water a few weeks ago, I wished I could FLUSH). Faith and prayers are answered daily, and my resources are abundant. So what does that have to do with culling the herd? Today, I prepared to burn an oak dresser for fuel for my wood stove. Who'd a thunk it? It was a free Craigslist find that I scrubbed the living mold off of. It was missing a wooden caster and would in the future require some major life support to be 'functionable' (new word, add it to your dictionary.) It felt like Sophie's Choice. I surveyed my garage for the most accessible piece, yet with the least emotional attachment. It was the right decision. All the hardware was removed for future use. I saved the drawer fronts, top, sides and some of the slats for sign making. The back would be transplanted to a dresser in waiting. And, I'm warm! What is is that worth? I can hear the furniture talking amongst themselves already. The piano knows his name has been bandied about as 'next' and he is in the closest proximity to the stove, cannot keep a tune, has p l e n t y of nice maple hardwood and parts that can be re-purposed, and takes up some mighty valuable real estate in my living room. I'm feeling a might like Dr. Zhivago. What do people do who can't afford heat, water, groceries, gas, mortgage payments, taxes, college repayments debt, car notes, health insurance, or even have a contingency plan. I am so grateful for even the 'grey' days that habit my life. Sometimes, when I compare myself to Job, I realize I'm not even in the same pasture. PS: In case while reading this, you think I gave short shrift to the fact that our house was on fire and some of my children and myself were within, let me share what daughter, Alisa said in summing up... It occurred a few days after Christmas, and there were many house fires that winter; many had fatalities. She said: "We had a fire, not a funeral." Perspective. The governor called and put a stay of execution of any more furniture. Not that a smaller inventory wouldn't be nice, but burning oak dressers is akin to burning her own limbs for my mother. 1/3 cord of wood was delivered Saturday. I will address your comment in a future post. Thanks for the wood Bethany. It is warm and burning nicely. Outside is 6 degrees and wind chill is 20 below. I can't imagine living in any other house that relies on gas or electric power. I remember a winter 20 years ago when Paddy was born and we had no wood. It was bitter cold. We loaded the sled with bins and went back in the woods for tree falls. The neighborhood had a power outage but we were plenty warm. Love you Boo.